Do you have lots of visitors but not a great deal of candidate applications? In other words, are you having trouble converting candidates? It’s a condition that affects many recruitment sites. But don’t worry - it can be fixed. There are lots of reasons for people being hesitant to register after they visit your website - you might not be the right company, you might not have any jobs at the moment but, in many cases, you'll have both but still the candidate won't register. We've been investigating the reasons this might happen and can now highlight our top three reasons why candidates don't apply. Job descriptions are incredibly important. It’s your opportunity to sell the job, create desire and entice candidates to apply. In order to write good job descriptions, try to create enough detail so that a prospective candidate feels like they already belong. Think about the reasons a candidate may want to change jobs - whether better conditions, feeling appreciated and a great working environment. Here’s a job taken recently from Indeed. 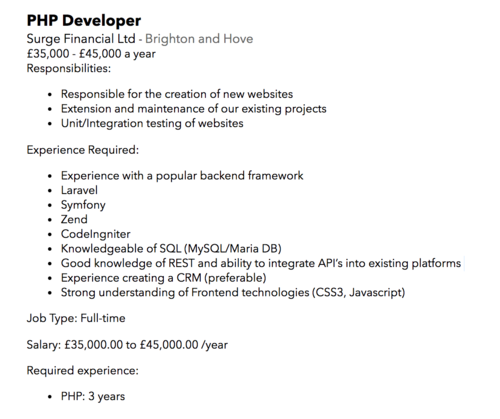 Would you want this job - even if you were a PHP developer? I don't need to tell you that this is the least enticing job advertisement you are likely to see. Details such as where will I work, how many hours, what are the benefits, is it a great place to work, what's my future and what is the company like are all missing. Think: if I wanted a job, what would entice me? It's only going to get more difficult to find candidates so now is the time to start thinking more cleverly. There are two main issues around website design that could be turning people away: firstly, you may be making it difficult for candidates to find the job that they’re looking for and secondly, you may be arranging your jobs in such a way that discourages people from registering. Some of your jobs are buried deep beneath disciplines. Elastic search can help but if you don't configure the disciplines in the way that the candidates want then it is likely to fail. The web is not like a physical office where candidates can walk through a door, establish that you exist and know that they have somewhere to come back to. On the web you have to establish trust. How do you look after your staff? Don't forget - how you care for your staff will be reflected in how they feel about you. This post isn't about getting more traffic, it’s about converting the traffic you receive. Make it easier for the candidate to apply than to leave by making the end result sound like an appealing, not-to-be-missed opportunity.